Between the 13th and 16th centuries the Ottoman state grew from a small Turkish principality in Anatolia into a sprawling empire that controlled territory in eastern Europe, western Asia, and North Africa. This transformation was accompanied by the development of a distinctively Ottoman style of architecture. 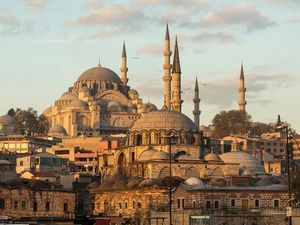 Across the diverse territories that had been gathered under Ottoman rule—and that had little in common in terms of language, religion, or culture—monumental buildings featuring massive domes and soaring pencil-thin minarets were instantly recognizable manifestations of Ottoman grandeur. The individual most responsible for developing and refining the classical Ottoman architectural style was a builder named Sinan (1491–1588), who served as the empire’s chief architect from 1539 until his death in 1588. During that time he designed hundreds of buildings, including mosques, palaces, baths, tombs, and caravansaries, and oversaw the construction of hundreds more. 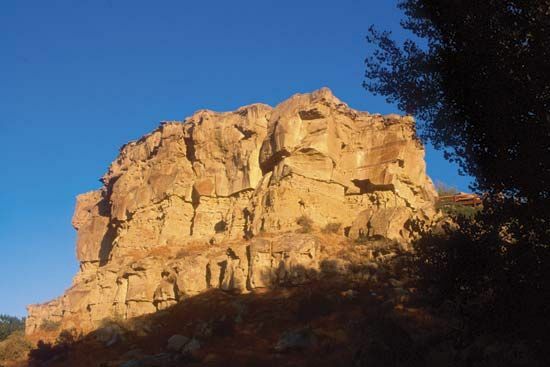 Sinan was born to a Christian family in southeast Anatolia. When he was 21 he was drafted into the Jannisary corps, an elite Ottoman infantry force who were recruited as adolescents or young men from the Christian territories of the empire and converted to Islam. He participated in the military campaigns of Suleyman the Magnificent, both as a combatant and as an engineer—the latter allowed him to develop the building expertise that he would put to use later in life. When Sinan was 47, Suleyman appointed him as the chief architect in Istanbul. Sinan embarked on a series of increasingly impressive buildings. His first large mosque was the Sehzade Mosque in Istanbul, dedicated to the memory of Suleyman’s son and heir who died at the age of 22. Another of Sinan’s most important works is the Süleymaniye Mosque complex, which remains an essential feature of Istanbul’s skyline. It is almost as large as the Hagia Sophia, a Byzantine church that was converted into a mosque in Ottoman times. The core of the building is a vast dome flanked by two semidomes, which combine to form an awe-inspiring interior space. The ground on which the Süleymaniye complex was constructed slopes toward the Bosporus strait; one of Sinan’s architectural talents was his ability to build on challenging terrain. The Selimiye Mosque, built in Edirne between 1569 and 1575, is considered Sinan’s masterpiece. In this building, Sinan managed to build a dome roughly as large as the dome of the Hagia Sophia, both having a diameter of about 31 meters. The dome sits on eight piers in an octagon, rather than the usual four larger piers, giving the central space a feeling of openness and weightlessness that is enhanced by the light that filters in from hundreds of small windows. After completing the Selimiye Mosque, Sinan continued to design smaller buildings until his death in 1588. 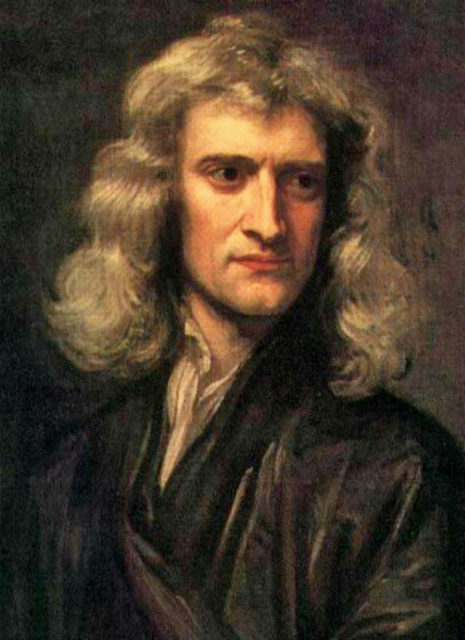 Sir Isaac Newton was a mathematician and physicist during the late 17th and early 18th centuries. 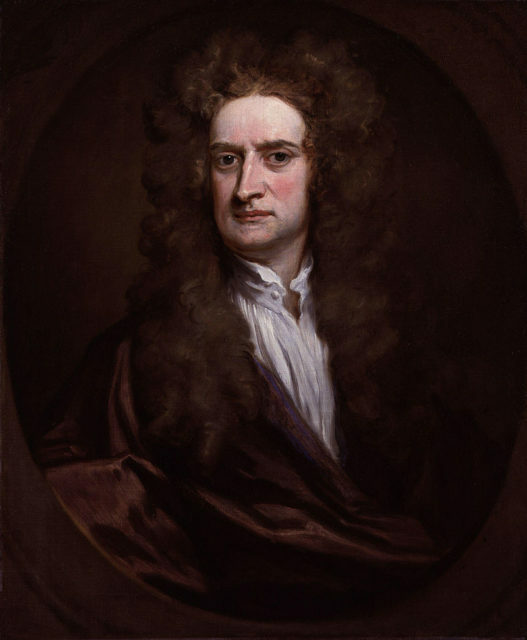 He developed the principles of modern physics, especially about motion and gravity, and was considered instrumental in the Scientific Revolution of the 17th century, according to Biography. Newton is a very multifaceted figure. He was undeniably a brilliant scientific mind, and a very pious man. He was also prone to fits of rage, insecurity, and social withdrawal, where he would do no work and isolate himself from everyone. 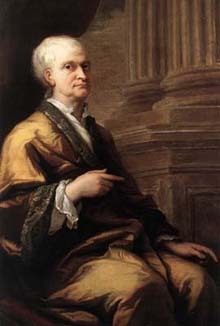 He had a longtime interest in the study of alchemy, and was searching for the recipe to create the Philosopher’s Stone, which was reputed to turn base metals into gold, and have the power to confer eternal life. Unlike with his interests in math and physics, his alchemical research was a very private pursuit, and was not driven by money so much as it was inspired by a desire for power over nature, according to Nova. All of these things taken together build a picture of a man who struggled with mental illness, probably bipolar disorder, according to Futurism. 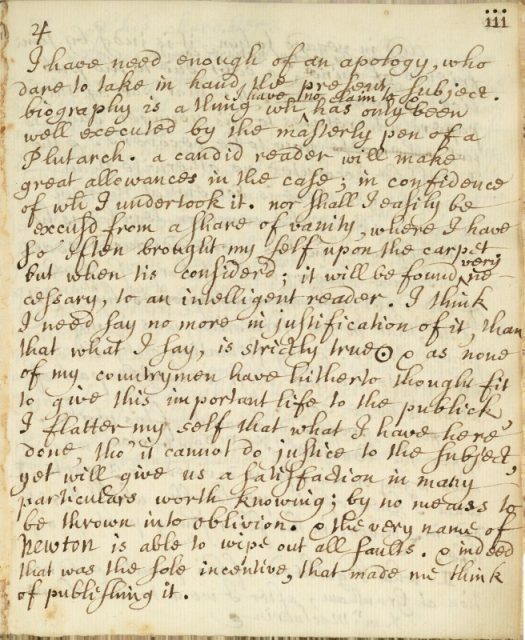 When he was around 19 or 20, Newton maintained a diary in which he cataloged a list of his sins. Examining his list, it’s clear that he had problems with anger from a young age. He identifies, among his sins, “peevishness” with his mother, his sister, and at “Master Clarks, for a piece of bread and butter”. He lists “falling out with the servants”, as well. You could say that bad temper and grouchiness are par for the course for a boy of his years, and that would certainly be true, but he also specifies, as number 13, “threatening my father and mother Smith to burn them, and the house over them”. He also cites multiple examples of physical aggression, punching his sister, beating people, and putting a pin in someone’s hat, so that it will scratch them. He comes across as anxious, egotistical, and dominating. Newton was not a people person. He didn’t make friends. 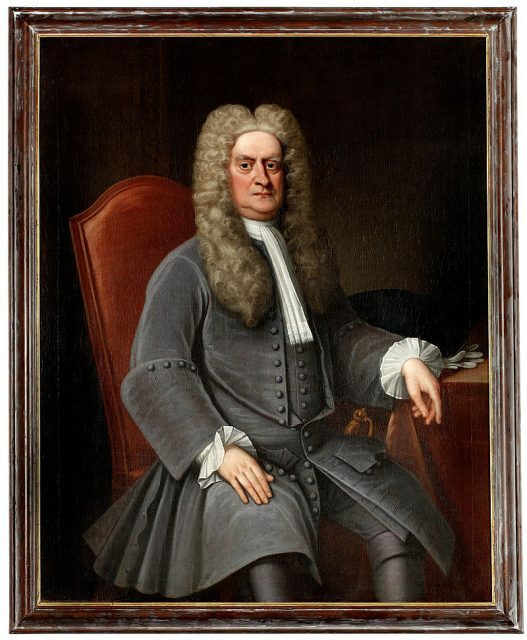 In his personal life, he only had close emotional relation relationships with two people, his niece Catherine Barton, who became his housekeeper in London, and a mathematician named Fatio de Duillier, who was only 25 when he and Newton met. 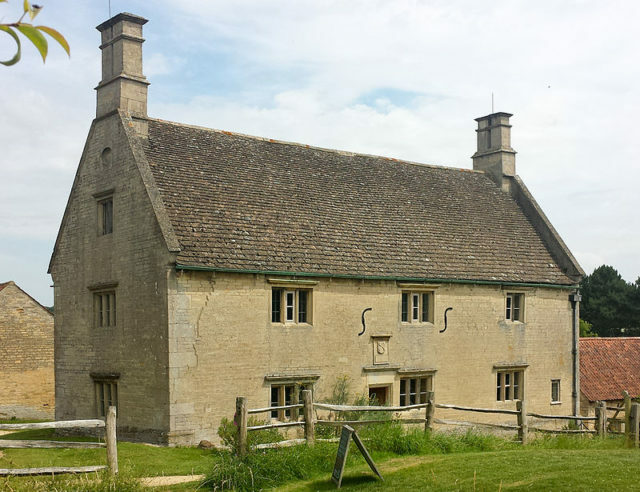 Their relationship was very emotionally intense, and neither man ever married, which makes some of Newton’s biographers speculate that the men were romantically involved, although there is no proof. In his professional life, he was very touchy and insecure about his work, and would fly into fits of rage over its criticism, resulting in his withdrawing and refusing to continue his work. These episodes of withdrawal could last for months. He shied away from fame, and requested that his papers be published anonymously. 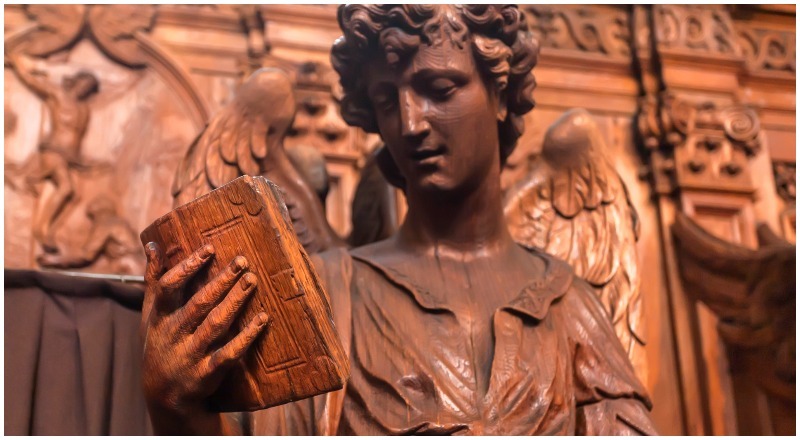 He had sincere religious beliefs, and was a nominal Anglican, but seemed to have a Puritan view of morality and religious observance, as can be seen from his list of sins. Multiple items reflect his notions of what he owed to God, and his remorse at not always living up to that standard. He had a keen interest in mysticism that was tied firmly to his study of alchemy. He believed that he had been chosen by God. In fact, the pseudonym he took to communicate with fellow alchemists was Jehovah Sanctus Unus, which translates to “Holy God”, according to the New York Post. 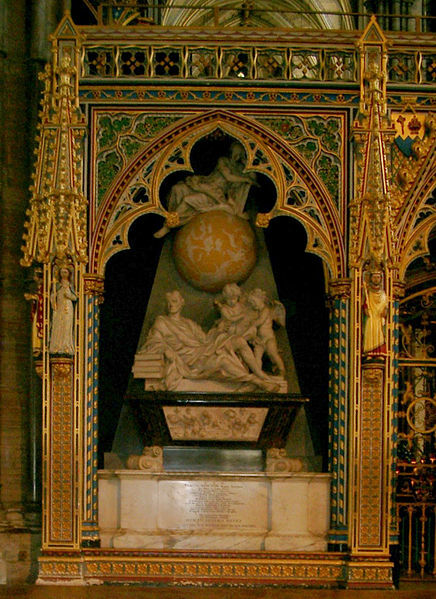 Despite all of these issues, Sir Isaac Newton was brilliant, and prolific in his work. His intellectual curiosity was not hampered by what was clearly a difficult personality, and despite his struggles and mood swings he still made a large and incredibly significant contribution to the world of science. Do We Really Use Only 10 Percent of Our Brain? It’s one of Hollywood’s favorite bits of pseudoscience: human beings use only 10 percent of their brain, and awakening the remaining 90 percent—supposedly dormant—allows otherwise ordinary human beings to display extraordinary mental abilities. In Phenomenon (1996), John Travolta gains the ability to predict earthquakes and instantly learns foreign languages. Scarlett Johansson becomes a superpowered martial-arts master in Lucy(2014). And in Limitless (2011) Bradley Cooper writes a novel overnight. This ready-made blueprint for fantasy films is also a favorite among the general public. 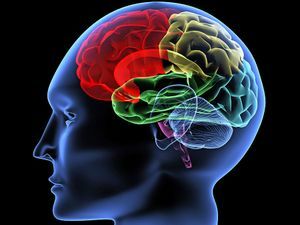 In a survey, 65 percent of respondents agreed with the statement, “People only use 10 percent of their brain on a daily basis.” But the truth is that we use all of our brain all of the time. How do we know? For one thing, if we needed only 10 percent of our brain, the majority of brain injuries would have no discernible consequences, since the damage would affect parts of the brain that weren’t doing anything to begin with. We also know that natural selection discourages the development of useless anatomical structures: early humans who devoted scarce physical resources to growing and maintaining huge amounts of excess brain tissue would have been outcompeted by those who spent those precious resources on things more necessary for survival and reproductive success. Tougher immune systems, stronger muscles, better looking hair—just about anything would be more useful than having a head full of inert tissue. We’ve been able to back up these logical conclusions with hard evidence. Imaging techniques, such as positron emission tomography (PET) and functional magnetic resonance imaging (fMRI), allow doctors and scientists to map brain activity in real time. The data clearly shows that large areas of the brain—far more than 10 percent—are used for all sorts of activity, from seemingly simple tasks like resting or looking at pictures to more complex ones like reading or doing math. Scientists have yet to find an area of the brain that doesn’t do anything. So how did we come to believe that 90 percent of our brain is useless? The myth is often incorrectly attributed to 19th-century psychologist William James, who proposed that most of our mental potential goes untapped. But he never specified a percentage. Albert Einstein—a magnet for misattribution of quotes—has also been held responsible. In reality, the concept most likely came from the American self-help industry. One of the earliest mentions appears in the preface to Dale Carnegie’s 1936 mega best seller, How to Win Friends and Influence People. The idea that we have harnessed only a fraction of our brain’s full potential has been a staple for motivational gurus, New Age hucksters, and uninspired screenwriters ever since. Obviously, this is bad news for anyone hoping to find the secret to becoming a genius overnight. The good news, though, is that hard work still works. There is plenty of reason to believe that you can build brainpower by regularly working at challenging mental tasks, such as playing a musical instrument, doing arithmetic, or reading a novel. Sacagawea, also spelled Sacajawea, (born c. 1788, near the Continental Divide at the present-day Idaho-Montana border [U.S.]—died December 20, 1812?, Fort Manuel, on the Missouri River, Dakota Territory), Shoshone Indian woman who, as interpreter, traveled thousands of wilderness miles with the Lewis and Clark Expedition (1804–06), from the Mandan-Hidatsa villages in the Dakotas to the Pacific Northwest. Separating fact from legend in Sacagawea’s life is difficult; historians disagree on the dates of her birth and death and even on her name. In Hidatsa, Sacagawea (pronounced with a hard g) translates into “Bird Woman.” Alternatively, Sacajawea means “Boat Launcher” in Shoshone. Others favour Sakakawea. 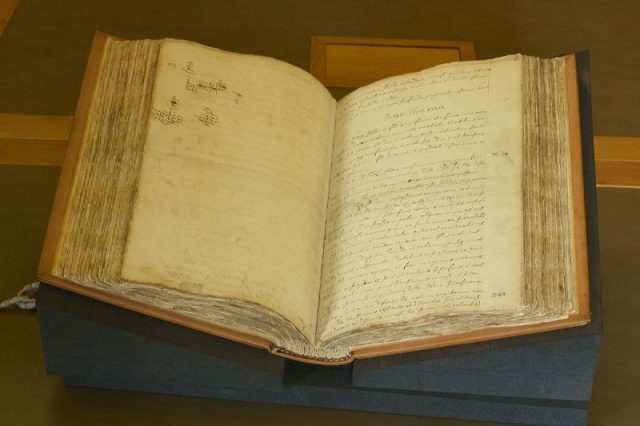 The Lewis and Clark journals generally support the Hidatsa derivation. A Lemhi Shoshone woman, she was about 12 years old when a Hidatsa raiding party captured her near the Missouri River’s headwaters about 1800. Enslaved and taken to their Knife River earth-lodge villages near present-day Bismarck, North Dakota, she was purchased by French Canadian fur trader Toussaint Charbonneau and became one of his plural wives about 1804. They resided in one of the Hidatsa villages, Metaharta. When explorers Meriwether Lewis and William Clark arrived at the Mandan-Hidatsa villages and built Fort Mandan to spend the winter of 1804–05, they hired Charbonneau as an interpreter to accompany them to the Pacific Ocean. Because he did not speak Sacagawea’s language and because the expedition party needed to communicate with the Shoshones to acquire horses to cross the mountains, the explorers agreed that the pregnant Sacagawea should also accompany them. On February 11, 1805, she gave birth to a son, Jean Baptiste. 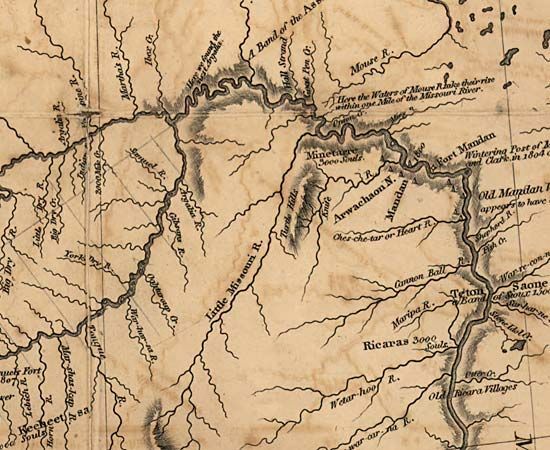 Lewis and Clark ExpeditionFort Mandan, detail from Lewis and Clark Expedition map by William Clark and Meriwether Lewis, 1804–06. Library of Congress, Geography and Map Division, Washington, D.C. Departing on April 7, the expedition ascended the Missouri. On May 14, Charbonneau nearly capsized the white pirogue (boat) in which Sacagawea was riding. Remaining calm, she retrieved important papers, instruments, books, medicine, and other indispensable valuables that otherwise would have been lost. During the next week Lewis and Clark named a tributary of Montana’s Mussellshell River “Sah-ca-gah-weah,” or “Bird Woman’s River,” after her. She proved to be a significant asset in numerous ways: searching for edible plants, making moccasins and clothing, as well as allaying suspicions of approaching Indian tribes through her presence; a woman and child accompanying a party of men indicated peaceful intentions. By mid-August the expedition encountered a band of Shoshones led by Sacagawea’s brother Cameahwait. The reunion of sister and brother had a positive effect on Lewis and Clark’s negotiations for the horses and guide that enabled them to cross the Rocky Mountains. Upon arriving at the Pacific coast, she was able to voice her opinion about where the expedition should spend the winter and was granted her request to visit the ocean to see a beached whale. She and Clark were fond of each other and performed numerous acts of kindness for one another, but romance between them occurred only in latter-day fiction. 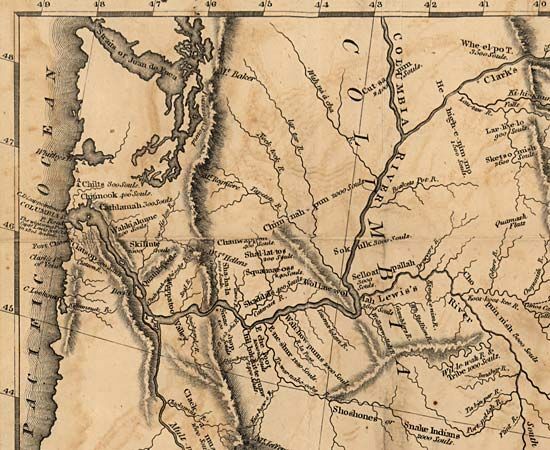 Lewis and Clark ExpeditionFort Clatsop, detail from Lewis and Clark Expedition map by William Clark and Meriwether Lewis, 1804–06. 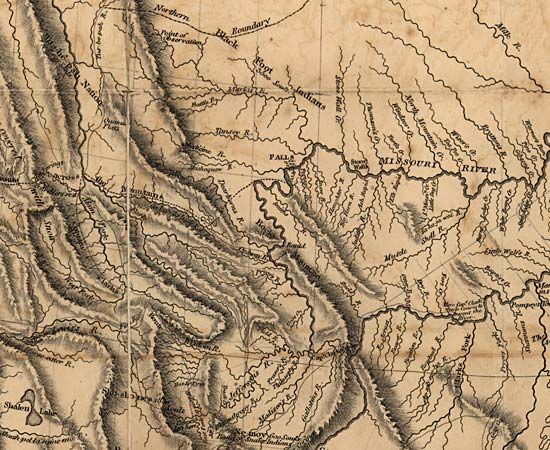 Library of Congress, Geography and Map Division, Washington, D.C.
Lewis and Clark ExpeditionHeadwaters of the Missouri River, detail from Lewis and Clark Expedition map by William Clark and Meriwether Lewis, 1804–06. Library of Congress, Geography and Map Division, Washington, D.C. The Charbonneau family disengaged from the expedition party upon their return to the Mandan-Hidatsa villages; Charbonneau eventually received $409.16 and 320 acres (130 hectares) for his services. Clark wanted to do more for their family, so he offered to assist them and eventually secured Charbonneau a position as an interpreter. The family traveled to St. Louis in 1809 to baptize their son and left him in the care of Clark, who had earlier offered to provide him with an education. Shortly after the birth of a daughter named Lisette, a woman identified only as Charbonneau’s wife (but believed to be Sacagawea) died at the end of 1812 at Fort Manuel, near present-day Mobridge, South Dakota. 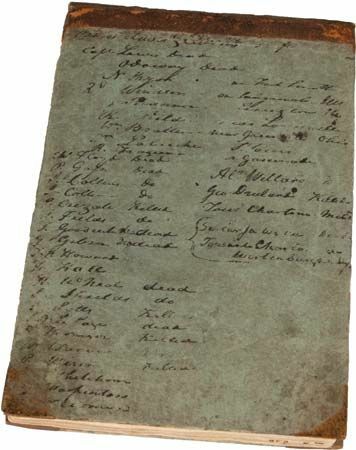 Clark became the legal guardian of Lisette and Jean Baptiste and listed Sacagawea as deceased in a list he compiled in the 1820s. Some biographers and oral traditions contend that it was another of Charbonneau’s wives who died in 1812 and that Sacagawea went to live among the Comanches, started another family, rejoined the Shoshones, and died on Wyoming’s Wind River Reservation on April 9, 1884. These accounts can likely be attributed to other Shoshone women who shared similar experiences as Sacagawea. 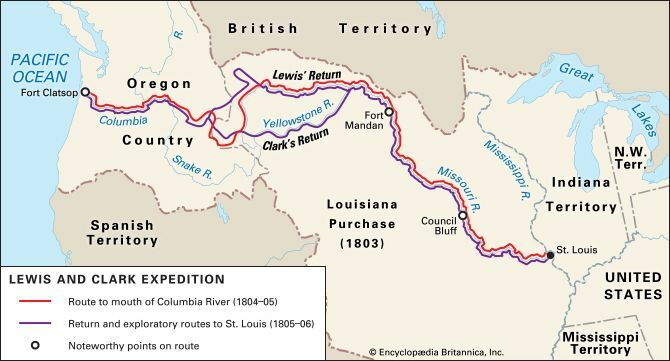 Lewis and Clark ExpeditionRoute of the Lewis and Clark Expedition, 1804–06. Encyclopædia Britannica, Inc.
Sacagawea’s son, Jean Baptiste, traveled throughout Europe before returning to enter the fur trade. He scouted for explorers and helped guide the Mormon Battalion to California before becoming an alcalde, a hotel clerk, and a gold miner. Lured to the Montana goldfields following the Civil War, he died en route near Danner, Oregon, on May 16, 1866. Little is known of Lisette’s whereabouts prior to her death on June 16, 1832; she was buried in the Old Catholic Cathedral Cemetery in St. Louis. Charbonneau died on August 12, 1843. 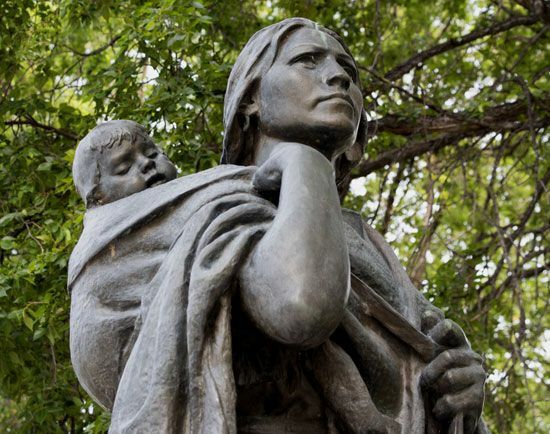 Sacagawea has been memorialized with statues, monuments, stamps, and place-names. In 2000 her likeness appeared on a gold-tinted dollar coin struck by the U.S. Mint. In 2001 U.S. Pres. Bill Clinton granted her a posthumous decoration as an honorary sergeant in the regular army. 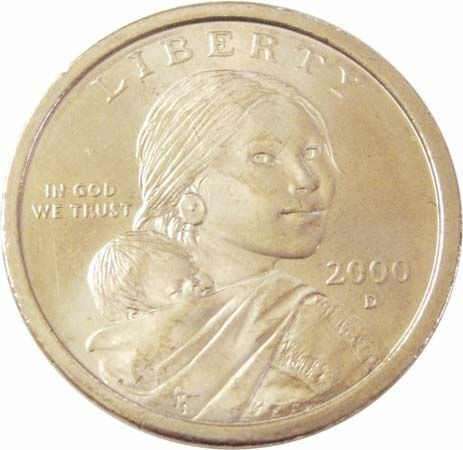 Sacagawea Golden Dollar coinU.S. gold dollar coin (obverse) featuring Sacagawea. Encyclopædia Britannica, Inc.